To the only UP Journ Prof who ever gave me an uno in anything..
﻿Diliman Voice staff phot-op with Ma'am Chit Estella right after publication of our first and only issue. (It was a class project.) 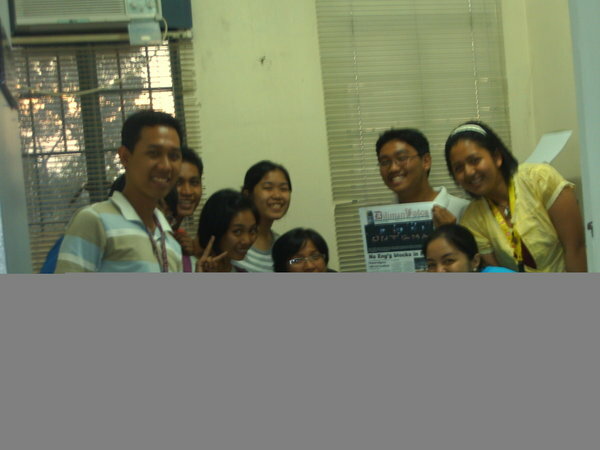 Photo is unfortunately half uploaded (grabbed it from my friend Anjo's blog) but incomplete as the image is, I guess the memories that solidified friendships and dreams in the production of that first and last issue will always mean more than just a required elective for us students who will always miss our MorningCHITChats. ﻿There are ways to be remembered but only a few are gifted with the means to do so without their consent, or intention even. These people will always be the brightest stars in the cosmos. They may not be part of a constellation, but they would shine as a world of their own. I would have to say that I am a proud former student of the late yet very epic journalist Chit Estella (aka Lourdes Simbulan to her students). Funny that it is only now that I would even realize that I have been calling her by different names without realizing it. I'm amazed by how she gracefully responds to both titles as if all great names can match her stature. I call her Ma'am Chit. I call her Ma'am Simbulan. Ahora, profa es una estella para me. Tomorrow she will be a fountain of hope. Funny how considering we never really got to well... CHIT-Chat, here I am, tearfully blogging for the love of Ma'am Chit, for the third time! (please read this link for the second wave). It's so difficult to put into words the feeling of losing someone who cast light upon you while you start the foundation of your future; especially if that someone is the someone who made you realize the heaviness of the red pen for the first time. Cliche as it may sound, words will never be enough, so I send her my thoughts. I send her my spirit. To the nicest professor, amiable, almost always late in class, but strikingly filled with wisdom and charm. Thank you. Thank you for making a difference. Thank you for making this forgetful person remember something so strongly, it's heavy. We’ ve been friends for a long time ago. We come from the same alma mother. Actually, our paths crossed one time on another. But it’s only now that I gave him a second look. I realized that beauty is in the eyes. The pulpbits of my heart went fast, really fast. Cute pala siya. And then, he came over with me. “The!?!!??”. .. ang sarcastic na sagot nya. Aba! The verb! Parang siya pa ang galit! Persona ingrata!!! Ang kapal niya! I cried buckles of tears. Na-guilty yata siya. Sabi niya, isipin mo na lang na this is a blessing in the sky. Irregardless daw of his feelings, we should go ouch na rin. Now, we’re so in love. Mute and epidemic na ang past. Thanks God we swallowed our fried. Kasi, I’m 33 na and I’m running our time. I’m in a state of shocked. Kasi mantakin mo, when it rains, it’s four! This is true good to be true. So siyempre, I said yes. Love is a many splendor. Pero nung inaayos ko na ang aming kasal, everything swell to pieces. What the fuss! The nerd ng babaeng yon! She said they were still on. So I told her, whatever is that, cut me some slacks! Who would believe her anyway? Dahil it’s not my problem anymore but her problem anymore, tumigil narin siya ng panggugulo. Everything is coming up daisies. I’m so happy. Kaya advise ko sa inyo—take the risk. You can never can tell. Just turn the bridge when you get there. Life is shorts. If you make a mistake, we’ll just pray for the internal and external repose of your soul. I second emotion. Kumi! Sobrang nalungkot ako nang hindi ko na mahagilap yung full version ng shot natin. But I believe it had to be up. It was my only shot with Ma'am Chit, and I regret not having a pic with our profs. If not for a failing grade, I would not have been part of our Diliman Voice class. And I'm very grateful and proud to be part of ours. Yep, she practically came 30 minutes into the class, just before many would deign to leave. The memories are great kumi! I was brought back to Multiply to go through them all.